DNC spokesman denies that "Democrats are using acts of violence for political gain"
Washington (CNN) -- Shots fired at a congressman's campaign headquarters. 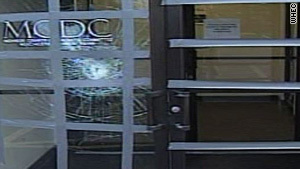 Windows smashed at Democratic offices across the country. A coffin placed on a lawmaker's lawn. Hate-filled voice mail messages left on members of Congress' phone lines. Those are just some of the incidents reported since the House passed historic health care reform legislation Sunday -- a bill that became the law of the land. The issue has unleashed a deep-seated anger from those worried about a government takeover of health care, and what they deem as the process being "rammed through" Congress. James Leach, with the National Endowment for the Humanities, said that while many of the acts may be protected under First Amendment rights, "that doesn't mean that they're morally justified." "And we have to think of ourselves as, 'what kind of people are we?' " Leach said. "Are we one people working together with rival thoughts, or are we enemies within? And I think there's something that's been let loose in American politics that has to be thought about." That anger was visible in unruly protests by health care activists at the Capitol over the weekend. Republican House members encouraged protesters outside and inside the House gallery, some of whom carried messages like "Vote no or else" or "If Brown won't stop it, a Browning will" -- a reference to newly elected Massachusetts Sen. Scott Brown accompanied by a silhouette of a pistol. But the anger has boiled over into physical and verbal threats. Windows have been smashed at Democratic offices in at least three states, and federal agents are investigating whether a cut gas line at the home of a Virginia congressman's brother was related to the lawmaker's yes vote. Republicans have the right to be angry over the Democrat's health care bill, but "resorting to violent measures is exactly the wrong way to send a message," Republican National Committee Chairman Michael Steele said Thursday night. Rep. Anthony Weiner, D-New York, confirmed Thursday that his district office in Queens received an envelope containing white powder and a threatening letter. Later Thursday, Weiner told CNN that initial tests indicated the powder was not a biological agent, but that he still was awaiting final word from the New York Police Department. Workers at the office turned over their clothes for testing and were given protective suits before being allowed to go home a few hours later, Weiner said. The FBI and other law enforcement agencies are now looking into the threats, and at least 10 House Democrats have been given extra security. The voice mail has been vicious toward Michigan's Bart Stupak, who switched his vote to seal the deal for the bill. He has released one of the voice mails. "Stupak, you are a lowlife, baby-murdering scumbag, pile of steaming crap. You're a cowardly punk, Stupak, that's what you are. You and your family are scum," an unidentified caller said. "That's what you are, Stupak. You are a piece of crap." "Go to hell, you piece of [expletive deleted]" another caller said. On Sunday, Democratic Rep. Russ Carnahan of Missouri had a coffin placed on his lawn, said his spokeswoman, Sarah Howard. She said Tea Party protesters at his office in St. Louis had a coffin with them and later brought it to his house. The coffin was later removed, she said. A brick damaged glass at the Monroe County Democratic Committee in Rochester, New York. Democratic congressional leaders have demanded Republicans join them in condemning a spate of threats and vandalism that has followed Sunday's vote on the health care system overhaul. The top Republican in the House, Minority Leader John Boehner, condemned the threats and vandalism, telling reporters Thursday that it "should not be part of a political debate." "There are ways for people to channel their anger, and they should do it in a constructive way," he said. Liz Mair, a Republican consultant, said protesters "are unfortunately crossing a line." "When we're talking about violence, vandalism, threats, that crosses a legal line, in addition to being in plain old bad taste," Mair said. "And I think that there's a lot that is in plain old bad taste that is going on." Democrats aren't the only ones being targeted. 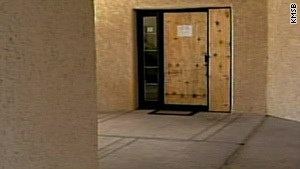 A glass door at Democratic Rep. Gabrielle Giffords' office in Tucson, Arizona, was vandalized after the health care vote. Rep. Eric Cantor, the No. 2 Republican in the House of Representatives, said Thursday that a bullet had been fired through a window at his campaign office in Richmond, Virginia. Watch Cantor warn against Democrats "fanning flames"
A Richmond police spokeswoman confirmed to CNN that a bullet was fired at the congressman's office. "We are investigating the circumstance surrounding it," spokeswoman Karla Peters said. Cantor also said that he had received threatening messages but that he would not publicly release the messages out of concern that doing so would only incite further violence. He also accused Democratic National Committee Chairman Tim Kaine and Rep. Chris Van Hollen of Maryland -- a member of the Democratic House leadership -- of "fanning the flames" of violence by using threats that have been made against Democratic members "as political weapons." "Enough is enough," Cantor said. "It has to stop." Democratic National Committee spokesman Brad Woodhouse hit back against Cantor's claims. "We disagree with the charge made by Rep. Cantor today that Democrats are using acts of violence for political gain," he said. "Let's be clear: Calling on Republican leaders who have contributed in part to this anger by wildly mischaracterizing the substance and motives of health reform to condemn these acts is entirely appropriate." I have 27 people that are going to make sure that this b**** does not live to see her next term. Goodbye. Another Republican -- Rep. Ginny Brown-Waite of Florida -- said in a news release Thursday that she received what appeared to be a death threat on her district office's voice mail. "Just wanna let you know I have 27 people that are going to make sure that this b**** does not live to see her next term. Goodbye," the voice mail said, according to the release. Brown-Waite said she contacted both the Capitol Police and the Hernando County sheriff, and they are "looking into the matter and subpoenaing telephone records." At least one of the threats aimed at lawmakers appears to be racially based. House Democratic Majority Whip James Clyburn, who is African-American, said he has received a fax in his office with a picture of a noose drawn on it and had threatening telephone calls at his home. "We're giving aid and comfort to these people, and this stuff gets ratcheted up," Clyburn told CNN. "We in this Congress have got to come together in a bipartisan way and tamp this foolishness down. It doesn't make sense. That's not what a democracy is all about." Democratic officials and liberal Web sites are also upset that Sarah Palin used an image of crosshairs in a Facebook post this week listing 20 vulnerable Democrats who voted for the legislation. She plans to target them this election year with money from her political action committee. Palin's team is fighting claims that she is encouraging threats of violence. One House member mentioned her Facebook posting during a Wednesday meeting on safety concerns, a Democratic source told CNN's Dana Bash. Mention of the map brought audible groans to the room, the source said. An adviser to Palin responded by pointing to several instances in which the former Alaska governor has urged supporters to focus their energies on civil debate and action at the ballot box, not extremist activities. CNN's Deirdre Walsh, Dana Bash, Peter Hamby, Ed Hornick, Lesa Jansen and Tom Cohen contributed to this report.